"I am aware that rumours have been circulating around my future and imminent departure from Croydon police. I wanted to ‘set the record straight’ so that you have the facts first hand, from me. Understandably, you will want to know what the current position is, who is currently at the helm and what the plans are with regards to policing Croydon for the foreseeable future. "As you know, I was appointed Borough Commander for Croydon in 2005. At that time, the challenges facing Croydon were considerable. Working in partnership with the local authority Croydon Council and other agencies, we have seen a turnaround and crime has gone down significantly in certain areas. However, we are not complacent and continue to look at ways in which our performance can be improved. "Europe’s first Family Justice Centre opened in Croydon in December 2005. It was an initiative between Croydon Council, Croydon Police and Croydon Primary Care Trust and is now becoming firmly established. During the last 2 years, it has helped more than 9,500 families and has prevented many murders from taking place. I am delighted with what has been achieved to date, however, it is a work in progress and the valuable work being done there will continue. I am proud to have been part of that work. "Last month I passed the first part of an assessment for promotion. I am now bound by ACPO guidelines, which require me to disengage from my current role. I am required to leave the borough within the next few weeks, as I have a course to attend. At the successful conclusion, I will be eligible to apply for senior positions at Commander and assistant chief constable level. "I have been fortunate enough to lead a dedicated team of police officers and staff at Croydon and their commitment to policing Croydon successfully will continue. 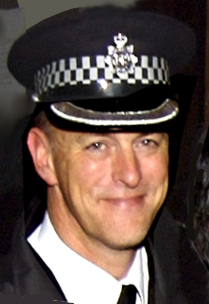 "Supt Adrian Roberts (who was born in Croydon) will be the Acting Borough Commander for the next three months. Adrian came to the borough in October 2007 as Supt of Operations. I know that Adrian shares my passion and pride where Croydon is concerned and I could not be leaving the borough in better hands. "It has been an enormous privilege to serve as Borough Commander for Croydon. Thank you for your support over the past 3 years.